Each week we will target a different social media platform for you to give our Dresstacular™ bloggers a shout out! This week we are going to focus on Instagram! Karina is new to Instagram, and she would love it for you to drop by and say hi! 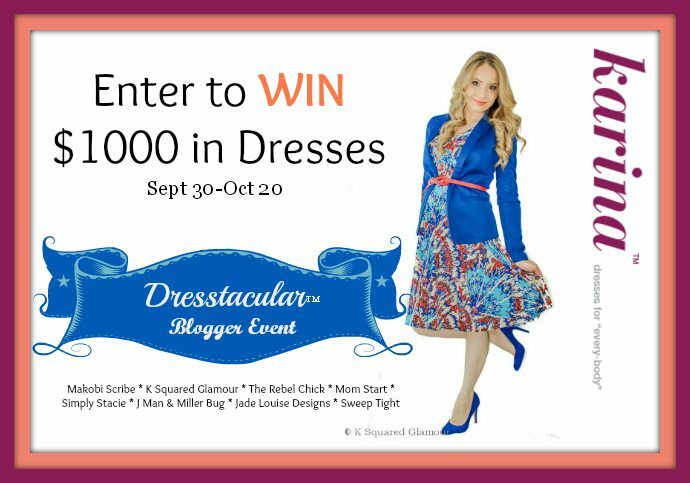 Use @KarinaDresses and #Dresstacular to let her know your favorite dress from the bloggers below! You can also get 100 entries a day by commenting on each of the bloggers posts from the linky below! love all of these dresses.! its nice to see dresses for all body types. Love these dresses! I enjoyed hopping around seeing everyone model their dress. I signed up for the newsletter and can’t wait to see what else they have. Thanks for sharing! I commented on all the blogs and it was fun actually. It was nice seeing the different body types in the different styles. Great idea. I also had trouble tweeting but amended the tweet so it would fit. Hope that’s ok.
What is with your tweets, lol. They are too long and won’t send. Copy and paste what she has written in the box into your tweet. I cannot find the link to post on a blog ?